The University of Arizona Poetry Center possesses one of the finest, most extensive, and most fully accessible collections of contemporary poetry in the nation. The Poetry Center’s library is most comprehensive in contemporary English-language poetry (including translations from other languages) from the last half of the twentieth century through the current day and maintains a strong representative collection of poetry from previous decades and centuries. The collection comprises single-author monographs, anthologies, literary journals, rare books, limited-edition books, artist-made books, chapbooks, broadsides, photographs, prose and critical works by poets, and audiovisual recordings. There is an open-shelf reference collection including dictionaries, directories, handbooks, encyclopedias, biographies, and bibliographies. The Poetry Center's collections are non-circulating, but are entirely open to the public. The majority of the Center's books are housed in open stacks ideal for browsing. In 1960 Ruth Stephan seeded the collection with several hundred volumes of poetry. By 1970 the collection had grown to more than 3,000 volumes. Supported by an acquisitions endowment provided by Stephan and her mother Myrtle Walgreen, the collection now contains more than 50,000 volumes of poetry; 29,000 issues of journals and periodicals (250 current subscriptions); 1,100 broadsides; and 5,000 photographs. Of the 1,500 audiovisual recordings in the Center's archives, dating from 1963 to the present, more than 900 are available online at voca, the Center's world-class digital audio/video library. The Poetry Center's books, periodicals, and broadsides are cataloged in the Library’s database. For more about how the Poetry Center selects materials for the collection, read our Collection Development Policy. Want to donate to the Library? Check our Library Donation Policy first. The collection includes, on a representative level, work of most poets writing in English in the twentieth and twenty-first centuries. Poets from earlier centuries and translations into English from other languages are represented on a more selective level. A variety of aesthetic viewpoints and poetics are collected, from the mainstream to the avant-garde, including a good selection of poetry from the margins. Publishers range from Norton to Green Integer, from Atheneum to Zoo Press. The New York School poets, the Beats, the San Francisco Renaissance, and the Deep Image, New Formalist, and L=A=N=G=U=A=G-E schools are well represented. There is also a large selection of confessional poetry, poetic memoir, and autobiographical poetry. The collection comprises single-author monographs, anthologies, literary journals, rare books, limited-edition books, artist-made books, chapbooks, broadsides, photographs, and prose and critical works by poets. The Poetry Center Library places a special emphasis on anthologies. The anthology section is divided into groupings that represent poetry in translation and bilingual editions from diverse continents, countries, and cultures. We seek out anthologies that are edited or translated by significant poets, represent important historical movements in poetry, highlight underrepresented groups of U.S. and non-U.S. poets, and provide insight into the world of poetry at large in a way that single volumes cannot. Anthologies of poets from the United States comprise about 25% of the anthologies section. Other groupings include African, African American, Asian American, Caribbean, Chicano/Latino, Chinese, Greek and Latin, Japanese, Korean, Latin American, LGBTQ, Middle Eastern, and Native American, to name just a few. There is also an extensive International subsection featuring anthologies that span several regions or cultures. The Poetry Center subscribes to more than 250 current journals and periodicals. Most of the titles in the collection are those which publish only poetry or primarily poetry, or which print poetry on a regular basis. Our subscriptions include 6x6; The Antigonish Review; Callaloo; Fairy Tale Review; Forklift, Ohio; Fence; Green Mountains Review; jubilat; The Kenyon Review; LIT; New Contrast; New Yorker; Ninth Letter; Poet Lore; Poetry; Poetry Ireland Review; PRISM international; A Public Space; Rain Taxi; Rattle; Volt; and ZYZZYVA, among many others. The Anika Burns Children’s Collection at the Poetry Center includes more than 650 volumes of poetry for children. Children’s books are grouped on the shelves by subject for easy browsing. Subject groupings include Alphabet Books; Creatures/Monsters; General Poetry; Novels in Verse; Song, Chant and Lullabies; Storybook/Folklore; and Anthologies. A Teacher Resources section presents an assortment of curricular and pedagogical materials for use in teaching poetry to children. The Rare Book Collection consists of items chosen for inclusion because of their age, rarity, aura, and physical beauty. Some of the works located in the L. R. Benes Rare Book Room date back to the beginning of the 20th century, including a 1900 edition of Leaves of Grass by Walt Whitman. Our rare and limited-edition works include books published by distinguished small presses, such as Ezra Pound’s The Pisan Cantos, published by New Directions in 1948; Allen Ginsberg’s Howl, published by City Lights Books in 1956; and Denise Levertov’s Embroideries, published by Black Sparrow Press in 1969. Many are books which have garnered an “aura” and are well known as central or significant in the poetry tradition, such as Ezra Pound’s Drafts & Fragments of Cantos CX-CXV11, 1969 and Marianne Moore’s Collected Poems, Faber & Faber, 1951. The L.R. Benes Rare Book Room also houses fine examples of work from the mimeo tradition—including work printed by d.a. levy, Diane DiPrima and LeRoi Jones/Amiri Baraka's The Floating Bear, and a copy of Ferret addressed by Michael McClure to Philip Whalen—in addition to 21st-century work inspired by that tradition from publishers such as Cuneiform Press and The Brother in Elysium. Other books serve as examples of beautiful bookmaking and are unusual because of their size, shape, or material composition. These works are often artist-made books or collaborative projects between writers, artists, and publishers. Some of our holdings include Alberto Ríos's Inside Chance, a sculptural book published by Picnic Press; Kenneth Patchen’s When We Were Here Together, published by New Directions with a cover hand-painted by the author (1 of 75 copies); Lyn Hejinian and Ray Di Palma’s Chartings, published by Chax Press (1 of 80 copies); and Dean Young’s hand-printed Original Monkey, published by Iowa City's Empyrean Press. Some artist's books found here are unique editions, meaning that the copy found at the Poetry Center is the only one produced. A list of Rare Book Room holdings, updated annually, may be found here. The Center's broadsides collection, housed in the L. R. Benes Rare Book Room, includes more than 1,100 items, many of them produced in extremely limited editions. The collection includes posters, fine printing broadsides, and ephemeral work such as postcards and broadsheets. The library has collected broadsides from a wide variety of presses, including Mummy Mountain Press and Tucson’s own Kore Press, SUN/gemini Press, and Chax Press. A list of broadside holdings, updated annually, may be found here. The Poetry Center has more than 5,000 photographs in its institutional photo collection, primarily images of writers who have read in the Center's Reading and Lecture Series from 1962 to 2011. The collection includes dozens of photographs documenting each writer’s visit. The Poetry Center’s photography project was initiated by director and professional photographer LaVerne Harrell Clark. The collection also includes photographs by Nancy Carrick Holbert, former director Lois Shelton, Christine Krikliwy, and Cybele Knowles. The Poetry Center is also home to the LaVerne Harrell Clark Photographic Collection. 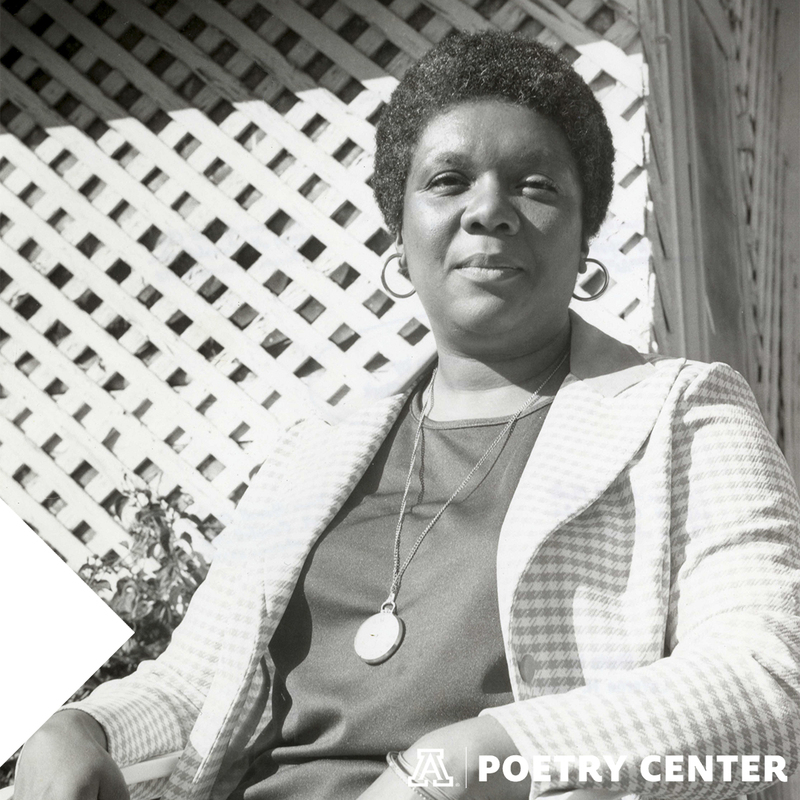 LaVerne Harrell Clark began the tradition of photographing the Center’s readers and visitors during her tenure as the first Director of the Poetry Center (1962-1965). For a full description of this historically significant collection, please see the Archival Collections section below. The Center's audiovisual holdings include more than 1,500 recordings, including long-playing records; the collection also contains recordings from the Center's Readings and Lectures Series or readings presented under the auspices of the Poetry Center. The earliest of these, a recording of Robert Creeley, dates to December 1963. Since 2007, with the support of The Gladys Krieble Delmas Foundation, the National Endowment for the Humanities, and the Southwestern Foundation, the Poetry Center has been digitizing its collection of born-analog Reading Series recordings and making them freely available online for public listening, with the permission of the authors and rights holders. Today, more than 900 recordings dating from 1963 to the present can be experienced online at voca, the Center's world-class digital audio/video library. You can also view our historical record of readings that have taken place at the Poetry Center.